Tyra Steam is the name of one of the buildings in the complex called Tyra Summit Condos. 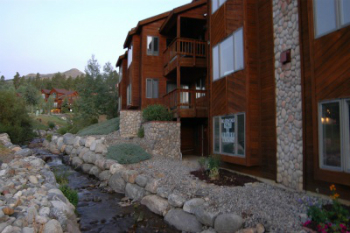 The Tyra Stream condos for sale were built close to the creek, which seems to run right under it. Its walkways cross over Sawmill Creek, which sounds and looks pretty summer and winter. All phases of Tyra Summit Condos lie between Four O’clock Road, Sawmill Creek and Four O’clock Run, a long, gentle ski run that makes all of Tyra a ski-in property. Each of the buildings in the Tyra Summit complex has a different advantage and Tyra Steam’s is the water. Discover the Tyra Stream condominium listings available below, or learn more about choosing Tyra Stream. Built in three phases from 1980 to 1993 these condos are situated in an open meadow of Sawmill Creek between Peak 8 and Peak 9, near the Snowflake Lift. The developers were resort pioneers from Miami, and these units were the first construction this high on Four O’clock. Since then, several high-end subdivisions have filled in the vacant private land. Neighbors include Trappers Glen, Snowflake, Snowy Ridge and other exclusive subdivisions. A few more than 100 units make up these condos, spread out in several buildings that have grown to look more different over time. All have done a facelift since they were first built, and show an up-to-date exterior. In the summer, ski runs and the snow-cat roads on the ski mountain are great trails for biking, hiking or wildlife spotting. A few hundred yards above Tyra is the Breckenridge Outdoor Education Center and the small Sawmill Reservoir. Several trails begin at the lodge at the BOEC and connect to other trails that extent far into the national forest. From the roundabout on the north end of Breckenridge take the most traveled route to stay onc Claimjumper Condos are close to the north entrance of Breckenridge Follow Hwy 9, which becomes Park Avenue and continue a very short distance to the first light. City Market Center will be to the left. Turn right onto Airport Road and continue for about ? mile to the Claimjumper Condos and turn left into the entrance that leads to the Claimjumper units that are a short distance from the road. We live and breathe Breckenridge real estate! Contact us today for more information about your opportunities in the local market.